The word for the week is: “fuerte”. One of my close friends is teaching me how to speak Spanish, and she taught me that that word means “strong”. Although this picture doesn’t exude me being strong, it does have a purpose. 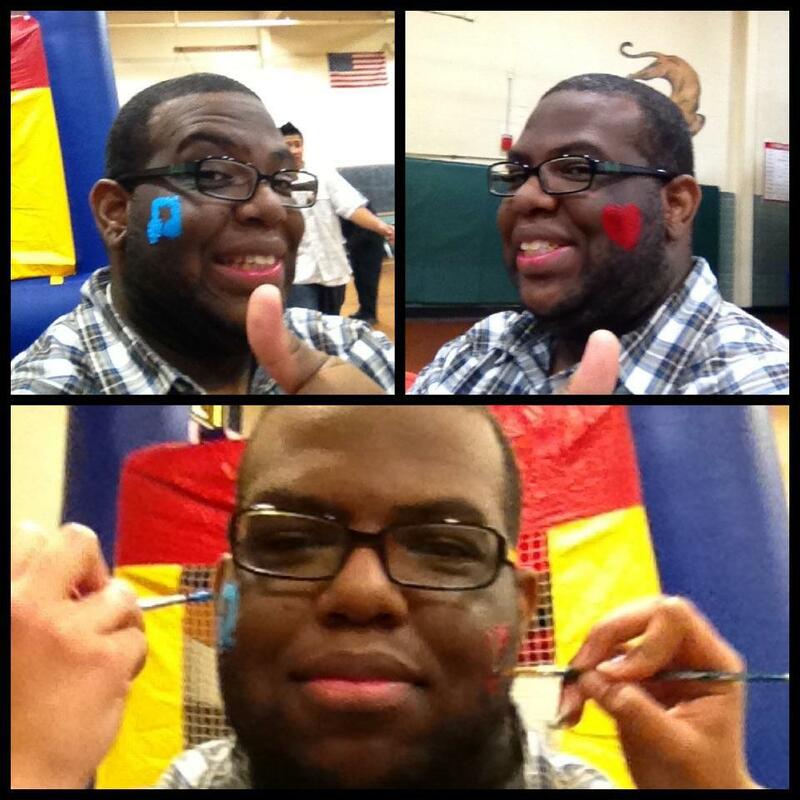 I decided to let the art students paint my face during a serving opportunity at our school. I really decided to go through with it because it’s not something that I would normally do. Sometimes I am too serious (can you believe it?). It’s good to loosen up every now and again. Music & Love: Two of my favorite things! For some strange reason, I’ve find myself being tested in that area recently. My car was “misbehaving” at the beginning of last week. I felt like a human milkshake every time I got out of it (it shook just that much). I called my neighborhood-mechanic-dude and decided to drop it off on Monday morning. This is my only vehicle, and frankly I didn’t have a clue how I would get to work. I also wasn’t sure how I would pay for this sudden repair, either. I immediately began calculating all sorts of different scenarios and solutions to questions that had not yet appeared. I was beginning to get flustered, as my heart began to pound profusely. Just in that instant, I reminded myself, “Yo, you can do this. It’s not the end of the world. You’ll get through it.” Fast-forwarding to today, where I have a repaired vehicle and a payment schedule. I am definitely thankful for how things have turned out because they certainly could’ve been worse. I also am encouraged because I wasn’t “given the spirit of fear, but of power, and of love, and of a sound [stable/strong] mind (2 Timothy 1:7)”. Instead of “freaking out”, I kept a stable mind about myself and that helped get me through. Sidebar: Right now, I’m at the point where I’m “chin-checking” everyone and everything in my life. I’m trying to figure out who needs to stay and who I have to let go. I am thankful for new friends, some friends who were here for only a season, and those who have shown themselves unworthy of a true friend. Wait, I should probably rephrase that: Those who have shown themselves incapable of cultivating a healthy friendship. [Is that better? I thought you’d like that.] Ha! Is it easy to determine who is in my life for the right reasons? Ehh, not really, but I’m hopeful about honing my skills as time goes on. I’m still figuring it all out. I’ll expound more on this topic in posts to come. As I type the last keystrokes of this post, let me remind you to: Appreciate who you are. Be yourself, and truly love others. Until next time. Stay Strong. Love & Peace. ← As if no one is looking.